This article is about a form of transportation in the Donkey Kong games. For the Yoshi transformation, see Hot-Air Balloon Yoshi. Hot Air Balloons (also parsed Hot-Air Balloons) are objects that are used for crossing large portions of lava in both Donkey Kong Country 2: Diddy's Kong Quest and Donkey Kong Land 2. 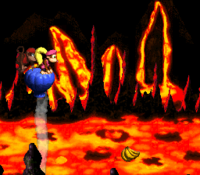 In Donkey Kong Country 2: Diddy's Kong Quest, Hot Air Balloons only appear in the level, Red-Hot Ride, where they are a main feature. Hot Air Balloons are large, about the size of Diddy and Dixie Kong. The Kongs can stand on a Hot Air Balloon and control the direction that it moves in by leaning either left or right. By default, a Hot Air Balloon slowly floats back down to lava, but can be slowly suspended back into midair if it is floating from a thermal column. Each thermal column is at a different height, and the Hot Air Balloon can stop rising when it reaches the top of the thermal column. The Kongs must maneuver the Hot Air Balloon past a series of enemies until reaching the next Hot Air Balloon or land. Diddy and Dixie usually do this process a few times before reaching land. Most Hot Air Balloons are initially positioned at the top of a thermal column, which gives the Kongs time to move onto. A couple of Hot Air Balloons have a DK Barrel or an enemy such as a Kruncha or Neek. The former enemy can only be defeated via Team-up or by using an object carried by the Kongs. In their second appearance, Donkey Kong Land 2, Hot Air Balloons have the same role as in Donkey Kong Country 2, although have a slightly wider appearance. Aside from appearing in Redhot Ride, Hot Air Balloons also appear in the Lost World level, Fiery Furnace. ↑ Donkey Kong Country 2: Diddy's Kong Quest SNES instruction booklet, page 16. ↑ Donkey Kong Country 2 GBA instruction booklet, page 15. This page was last edited on April 14, 2019, at 20:54.